In a epic faux pas heard around the Internet, HBO may have accidentally spoiled the "Game of Thrones" books, revealing the future of the George R.R. Martin fantasy series. The Night's King is a character that is speculated about in Martin’s “A Song of Ice and Fire” novels, the inspiration for HBO's "GoT," but he doesn't actually exist in the series yet outside of the characters' bedtime stories. 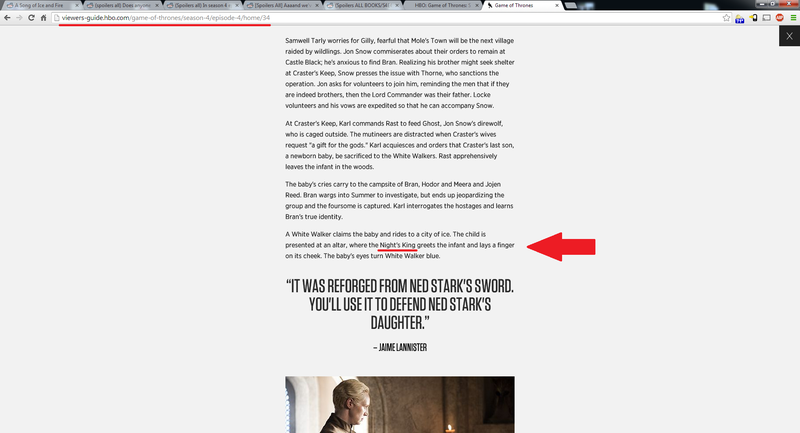 HBO replaced the “Night’s King” reference in the synopsis with “a Walker,” but not before a savvy Reddit user took a screen shot (see below), according to Yahoo Celebrity Canada. Currently, Martin has released only five books in the fantasy series. If HBO has revealed the existence of a Night's King who is making an army out of babies, it is a major spoiler for the remaining unreleased books and super bad news for whatever White Walker is on diaper duty. You can watch the alleged Night's King scene below.